Feb. 3, 2010 — Bricks, graves given “most notable” status. Columbia Daily Tribune. Brick streets named to Most Notable Properties list. Oct. 21, 2015 — City of Columbia brick street background information, Complete with a cool map! February 1994 — A Final Report of Survey of the East Campus Neighborhood, Columbia, Missouri, Osmund Overby, Howard Marshall, Scott Myers, Debbie Sheals, Ray Brassieur. History comes in all shapes and sizes — including streets. 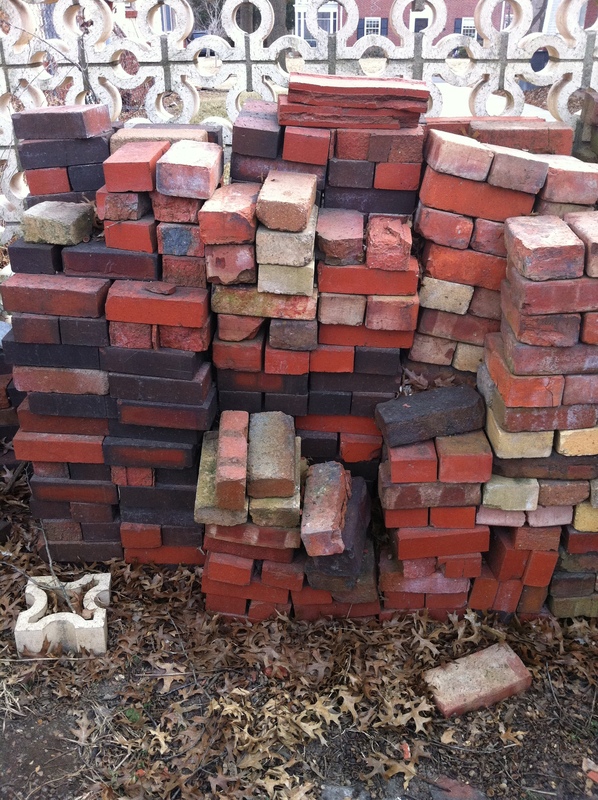 Bricks once meant big bucks in Columbia, Missouri. In 1908, The Edwards Brick Co., invested $50,000 — $1.3 million in 2012 purchasing power according to MeasuringWorth.com — and employed 40 men, producing 25,000 paving bricks a day. The big buck investment was cited in Brick, Vol. 29, published in October 1908. By the time the company closed in 1985, the name had been changed to Columbia Brick and Tile, but the employment and output hadn’t changed much. According to a Sept. 12, 1971 article in the Sunday Missourian Magazine, the plant produced 35,000 bricks a day and employed 35 men, including owner operator Bill Powell. Now Columbia has approved fixing the city’s brick roads, citing their historic value and even the economic value of brick roads. Asphalt roads must be replaced every 15 years, while brick roads can last more than 100 years, notes a March 16, 2014 article by Veronike Collazo published in the Columbia Missourian. On March 17, 2014, Collazo reported the city approved restoring brick streets in Columbia over the next 20 years. See this city map for information on where brick streets are now. In the agreement, it should be noted, the city agreed to limit the cost and include characteristics to make brick streets safe for persons with disabilities. Today, the brickworks once at 2801 E. Walnut, Columbia, Mo., is roughly under the Lowe’s on Conley Road, according to Liz Kennedy, the sister of the now late John “Jack” Kennedy, the last operator of that brick company. Kennedy noted that Columbia once supported a half dozen brickworks, an industry she says was put out of business due to several factors: increasing regulations, soaring energy costs, the availability of inexpensive mass-produced bricks and a shift toward a demand for perfect and uniform colored bricks, something the beehive kiln bricks of the local company couldn’t be counted on to produce. Today, the reminders of the brickworks exist in a stack of a wide variety of brick and tile at Liz Kennedy’s home — and the brick buildings in Columbia. 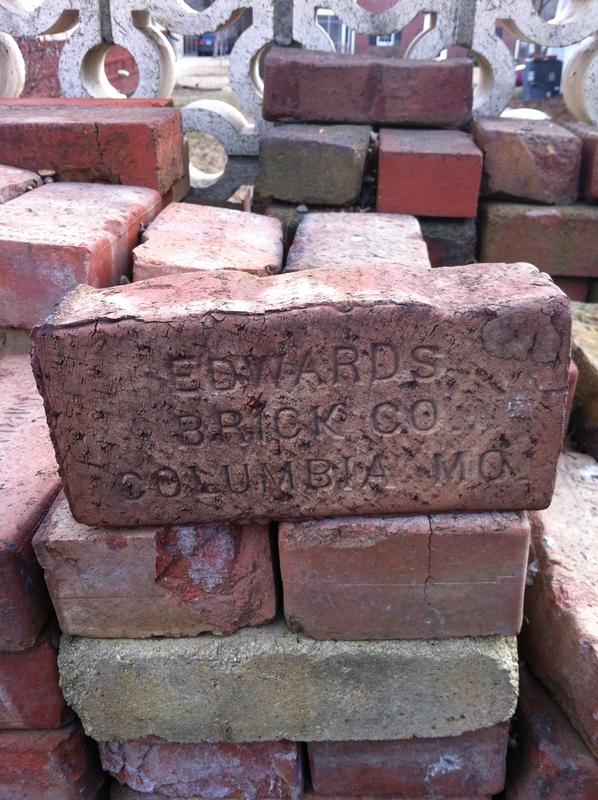 Bricks and tile from Edwards Brick, later called Columbia Brick and Tile. But the energy costs Liz Kennedy cites might not have affected W.E. Edwards who established the Edwards Brick and Tile Company in 1896. In 1907, he sank a shaft at the works “so as to get at the coal to use at the works,” notes the 1907 Clay Record, Volumes 31-32 by J. Dixon Doyle and George H. Hartwell published by Clay Record Publishing Company. In 1930, the plant became the Edwards-Conley Brick and Tile Company, when Sanford Conley joined the firm. In 1945, Edwards sold his interest to A. Burnett Coleman. In 1947, the company’s name was changed to Columbia Brick and Tile, following the death of Conley died and the sale of his interest to Hart Robnett. In 1950, Fred Kennedy and William Powell bought the plant. In 1966, Fred Kennedy died and his son Jack Kennedy continued the firm in partnership with Powell. History, economics drive decisions on brick streets — Nov. 7, 2011, updated Nov. 8, 2011. Columbia Missourian. This Columbia Missourian article highlights the brick streets of Columbia with a map of their locations. In 2010, the Columbia Historic Preservation Commission named Columbia’s Brick Streets to its list of Most Notable Historic Properties. Click here to see a map of where the brick streets are and when they were paved. Cherry Street. From 4th Street to 7th Street. Paved 1912. University Avenue. From College Avenue to South William Street. Paved 1911. Lee Street. From Bouchelle Avenue to Wilson Ave. Paved 1909. Bouchelle Avenue. From College Ave. to S. William St. Paved in 1909. Short Street. From Broadway to Walnut St. Paved in 1909. Waugh Street. From Broadway to Locust St. Paved in 1911. Glenwood Avenue. From Broadway to Stewart Road. Paved in 1909. Sanford Street. From Conley Avenue to Turner Avenue. Unknown when paved. Seventh Street. From Locust Street to Elm Street. Paved in 1912. Lowry Street (Lowry Mall). From Ninth Street to Hitt Street. Paved circa 1915. Original bricks were used to repave the street into a mall in 1984.